This page contains links to the ECIC Policy and Action Center which features periodic Legislative Policy updates from the Early Childhood Investment Corporation (ECIC) on Early Childhood Issues. The ECIC website also has a dynamic policy and interactive advocacy page. For other interesting news articles and informative studies click on the links below. Through the Great Start Initiative, and your hard work, Michigan has made significant progress towards developing a statewide early childhood development network. But our work is not complete. There are still areas where we can improve as a state to ensure that all of our children between the ages of zero and four have a safe and healthy environment to learn and grow. 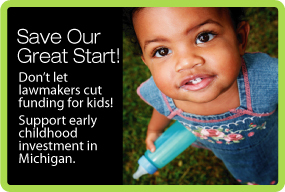 Please take a moment and send an email or write a letter to your elected officials and encourage them to consider the positive impact that this proposed investment in early childhood development will mean for Michigan’s young children, their families and the future well-being of our state. Developed by the Early Childhood Investment Corporation and the Sandbox Party, this Advocacy Toolkit, will help you learn how to educate key audiences and encourage elected officials, business leaders, educators, and others to support early childhood initiatives. What is advocacy? Why should you become an advocate? 4 different types of advocacy: case, administrative, legislative, and media advocacy, includes strategies and examples for each. Clear and concise ways to discuss complex issues to target audiences such as lawmakers, early childhood practitioners, and members of the business community. General tips for building strong personal relationships with your legislators with email, letters, phone calls and more. How to schedule an in-person meeting with your elected official, best practices to prepare for your meeting, and how to follow up your visit. Also, a how-to guide on site visit strategy for building lasting relationships and impressions.